I happen to have a server available! TWHL Minecraft Server #3, anyone? How about getting started with some Modded Minecraft this time around? We've been playing vanilla on all of the previous TWHL Minecraft server so let's change things up a bit with some mods. I'm thinking, just a handful of mods, no more than 15/20 or so mods so things keep running smoothly. First things first though, we need to decide what mods to choose. Do we want tech mods, nature mods, magic mods, building mods? Before I even install the server, these are the things we need to get sorted out. The base Minecraft version will be 1.12.2. 1. Download the Forge installer and run it. Choose Install client. This will create a new profile in your launcher. If you don't use the official vanilla launcher, additional steps may be required to get the profile created. Consider installing your client in a different location other than the default location (AppData\Roaming\.minecraft). This makes it easier for you to get work done on config files or updating mods. My client installation is located at D:\TWHL Modded Minecraft\. 3. Fire up your launcher and make sure the correct Forge profile is selected. Allocate 6 gb of memory to Minecraft. If you did step B, set Game Directory to that custom location you've set in step B. 5. Download the zip file with all the mods if you haven't already. Inside the zip, you'll find 3 folders. Extract all 3 into your client game folder. A config and a mods folder should exist already so simply overwrite these. 6. Launch the game. If you get to the main menu without any crashes, installation is successful. 7. Give me your MC usernames so you can be whitelisted. Thermal Expansion, EnderIO, Ex Nihilo with Ex Compressum, SolarFlux, Refined Storage are all good mods. I only accept mods compatible with 1.12.2, Ex Nihilo with Compressum and SolarFlux are 1.7.10 mods. Nope, those are all 1.12.2 compatible, i'm using them in my custom version of FTB Revelation which is 1.12.2 as well. The exact names will differ because the ports are usually maintained by somebody else. Yeah those are the ones. Tell me what mods to get and I'll jump on the server from time to time! I'm going to create a zip file with all the mods inside, there's no need to download each one individually. If you have any mod suggestions, now is the time to tell. A list of currently confirmed mods will be in the first post. Mystical Agriculture is another good one. A good alternative to quarrying holes in the world. Immersive Engineering also has some good stuff, and lets you make stuff like ziplines. RFTools has good machines for various tasks. Tinkers' Construct has tools to make mining go way faster. You'll probably want integration mods between them too, so you can do stuff like smelt TE metals in a TC smeltery. 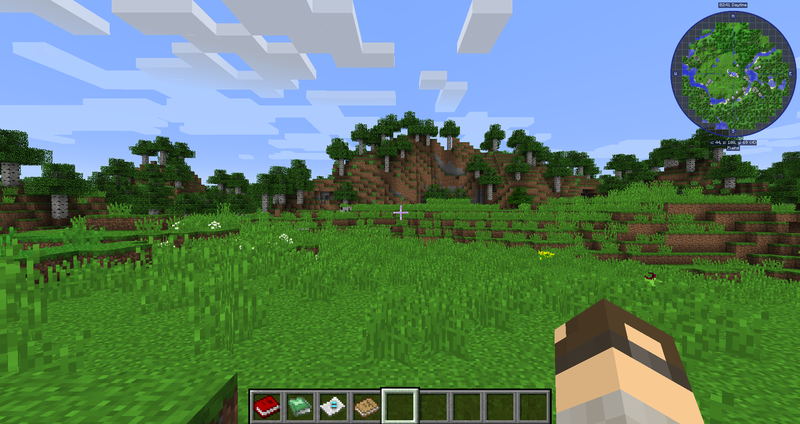 Biomes O Plenty adds a bunch of new biomes if you want those. I'm interested, would it be possible to have a list of links for the confirmed mods with their versions? The main reason for this is because I don't use the official MC launcher but MultiMC (it's not a crack, it's a lightweight launcher with neat features, the ownership of the game is still required). I'll add these, I have experience with all of those mods, except Mystical Agriculture, but it looks interesting. I think you can do that already. What other integration mods do you suggest? Once we've decided which mods to play, I'll put together and provide a zip file containing all the necessary client side files, this includes all the mod jar files and config files. Looks like it isn't necessary anymore these days, it was the case in older versions. If you want you can add Extreme Reactors to the list, it allows for large scale power generation. It may be better performance wise for the server compared to lots of smaller power generators. In EnderIO's case, one of the latest updates added the Grains Of Infinity item for crafting, as well as needing to use dyes to craft machines. The recipes can be reverted by using config\enderio\recipes\examples\legacy_recipes.xml. The file explains how to use it, it reverts everything to the old redstone and iron based recipes. Since grains can only be acquired by setting bedrock on fire or using Ex Nihilo/Compressum to grind for them, it can really slow down EnderIO progression. It's up to you to decide, i personally prefer the old recipes since the mod is already grindy enough when it comes to teching up. Yeah, the new Ender IO is grindy but honestly I thought it wasn't too bad. It took me some effort to get that advanced SAG Mill though and honestly, I kinda liked working towards that goal. I considered adding Draconic Evolution as well but maybe we shouldn't. I think that's enough mods for now. I'm going to put everything together and update the first post with a download link to the zip containing all the mods. This may take a day or two. I've added Quark and NoMoreRecipeConflict, the latter sounds useful. Looks like you're in the middle of a plains biome surrounded by forest. A good starting position, but i prefer to start near an intersection between forest, desert and swamp to get wood, sand and clay in large quantities. This was just a test launch on a creative world. I cannot guarantee that spawn is located at such a location though. I will try a couple of seeds out and see what I get. On the next startup, the game boots up fine. Fixed in dev, but not pushed to a release yet from the looks of it. I'm at least able to go into the Quark config screen after entering a world, so I guess it's fine. 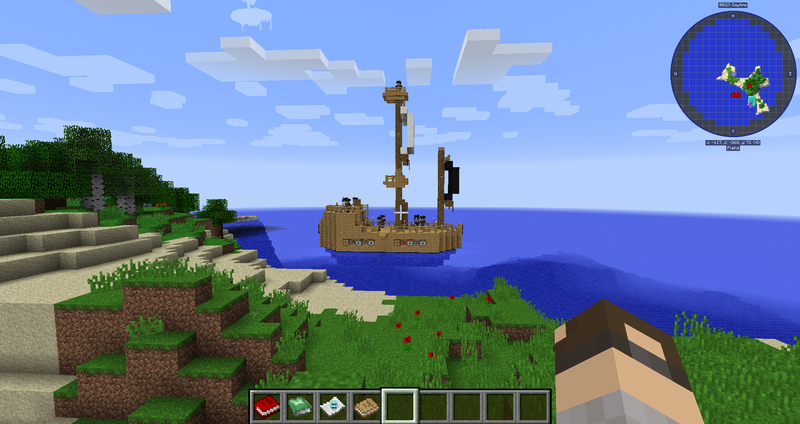 Oh it has the mod with the controllable boats? No, that ship is generated by Roguelike Dungeons. It's a dungeon type, basically. When are you planning to open it up? That pirate ship is actually from Quark, if I recall correctly. Atleast I had this exact same ship in my singleplayer world, and I'm sure I didn't got Roguelike Dungeons installed. I also didn't run into any problems regarding Quark and ProjectRed, though not sure if I got the whole "Suite", there's only 7 mods regarding ProjectRed in my mods folder. Hopefully saterday or sunday. I will upload the zip file with all the mods and other client side files very soon. Check back later in half an hour or so. Must've been a different pirate ship then because I'm pretty sure RogueLike Dungeons has one as well. Odd, looks like the same files, maybe you had an older version of Quark that didn't caused the crash? Who knows. Oops. I will add that one. EnderIO doesn't seem to like OptiFine that much though, but It'll work. For those that don't know, instructions on installing the client is now in the first post. Link to the required Forge installer and the zip file can be found as well. I haven't decided on a seed yet so feel free to try out some singleplayer worlds to get a nice looking worldseed for the server. I don't know why the "Save Map" feature is cutting out part of the map here, it just isn't capturing it. It has a bunch of different biomes close by. Lots of birch forests, a desert, a couple extreme hills mountains, lots of swampland and plains. There's a village close by as well. The spawn point is near the center, in the small plains area between the 3 floating slime islands. Never had such problems with JourneyMap. That looks like a nice starting area. Will go with that. Should spawn you next to a village in a relatively flat savanna biome. That one looks good. There's swampland and extreme hills to the north-west along with a village. Looks like there's a desert temple right next to it as well. Ugh, I'm having some real trouble getting Forge to install. Google is not helping much other than to let me know I'm not the only one. Hopefully I'll figure something out. I had some trouble with it as well. I use the Twitch client so i initially tried to install Forge to its directory which didn't work. When i installed it into the default directory it worked and it showed up in the profiles list in my Twitch launcher. I changed the game directory after that to point elsewhere. Man, it's not even letting me do it through a different launcher. It's throwing me some rubbish about not being able to download libraries. Third party launcher seems like its having the same trouble. I... don't know what to do. I had that error as well, just run it again. I've run it about a dozen times, under different circumstances. Different launchers, different directories, through a command line, reinstalled Minecraft, reinstalled Java... it just ain't working. EDIT: Different computers, even! It seems unlikely that Forge is just fucked in some way... but I don't really have anything else I can try. It would probably be easier to make a Twitch mod profile and import it there, but i don't know if it would be compatible with the one that The Mad Carrot made. My mc username is "torekk", but seeing you recommend to allocate 6gig of RAM I'm not sure if I'll hang around as my PC only has 4gig, depends on how the game runs for me. It includes the same directories as the mod pack archive, same Minecraft version, same Forge version. I hope it's compatible. Bummer you're having issues, Jesse, hopefully Solokiller's Twitch mod profile will work for you. It looks like the Forge site is having problems, I can't seem to download Forge as well. I'm sure it'll be fixed soon. @SourceSkyBoxer: didn't you leave TWHL two months ago? If you're adding more mods, could you also add VeinMiner to it? I'll update the Twitch profile once we're sure it's all locked in. VeinMiner, doesn't that mine an entire vein of ore? I've never been a fan of that, it's too easy in my opinion. I already made it easier to progress in Ender IO. Plus, there are mining tools available that allow you to mine multiple blocks at once. Let me think about it. VeinMiner lets you mine every block of the same type that's within one block of a group you're mining. It only works on blocks that are whitelisted, like clay. It also uses up your tool's durability, so all it really does it let you mine groups of ores or resources more quickly. It's not a big deal if it's not there, but it's a nice to have type mod. I'll add it, but then it would be fair to only have it vein mine ores and clay, not sand, gravel or various stones. I don't think it can mine stones, sand definitely isn't affected, but gravel is. You can configure it through the mod settings in the menu. I will configure it, then repack the zip file, it will include the mods I forgot to add. I'm just waiting for the Forge website to work normally again, as I need to install Forge on this computer (I was on my laptop earlier). Well then... I guess I failed there. You should try to install it using the Twitch client, it looks like it downloads Forge from its own servers. A perfect square going down quite a bit, there's gravel at the bottom. That happens when you add mods and then load a world that was created without those mods, causing the worldseed to changed. That means that those worldseed you posted earlier probably produce a different world now. Processed in an annoyingly mesmerising 1486 milliseconds.